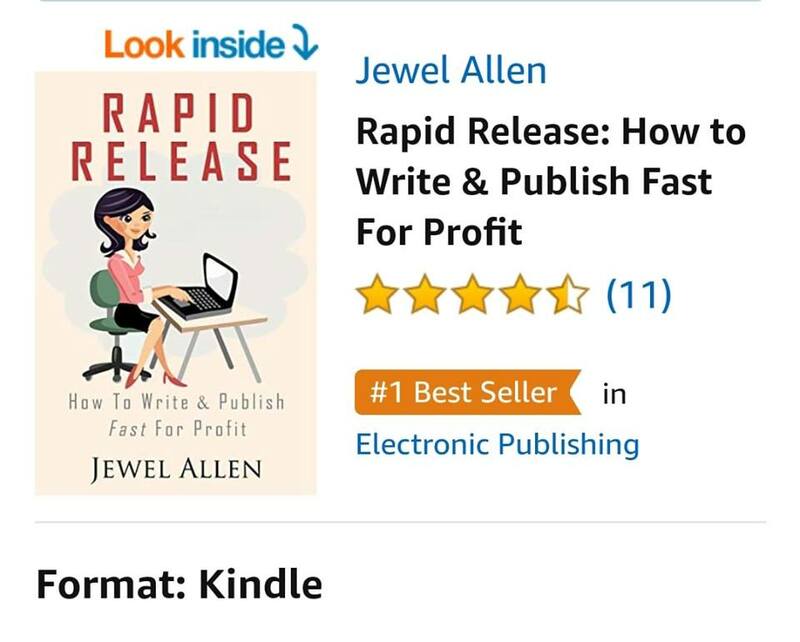 My publishing how-to book Rapid Release: How to Write & Publish Fast for Profit had been out for two weeks, earning a #1 New Release flag out the gate simply from me sharing on social media. But I noticed that other books had a best seller flag. I wondered what it would take to get one for my book. I had been itching to take it out of its 99 cent price point. Should I hold out and wait? In an author group, I asked, “What does it take to get a best selling flag on Amazon?” Someone answered, if you place #1 in any category. As a follow-up, an author friend of mine advised me to look at the category it’s ranking high in and see what the rank of the #1 book was. That was the number to beat. That made complete sense, but it hadn’t occurred to me. Authorship was the category I could try to place #1, but I would have to sell quite a few books before I could move the needle. RR was in the 8,000s, while the #1 book was in the low 7000s. I planned to run a Facebook ad, but I knew getting it lower (the lower the rank the better) was going to be tough. I also didn’t want to spend too much money on it since it was already a loss leader at 99c. I wanted that best seller flag mainly for visibility. I mean, it sounds cool and all, but if I could keep its rank up there and pique people’s curiosity because of the flag, I hoped it would help my sales along too. I looked at other books ranking alongside mine and discovered a category called “Alphabets”. That was a not as competitive category as Authorship. But putting my writing how-to in Alphabets sounded strange. I didn’t see what that had to do with my book. However, Electronic Publishing was promising. So tonight, before I went to City Council, I emailed KDP to add my book to the Electronic Publishing category. By the time I came home from the meeting two hours later, my book had been added to that category and had earned #1 best seller status. To some, this might seem like gaming the system, but it seems like a perfectly legitimate way to improve the ranking of my book. Especially since I put it in categories that still made sense for my book. My biggest takeaway: to gain visibility as a best seller, tweak your keywords by paying attention to what other books are ranking alongside your book. I plan to apply this to my future novel launches. Check out Rapid Release HERE.